The Avalanche will play its second full game without Nathan MacKinnon Saturday at Winnipeg. The start of his two- to four-week absence from the lineup comes amid a testing stretch of the Colorado schedule so road-dominated, it should come with tour T-shirts listing the stops. 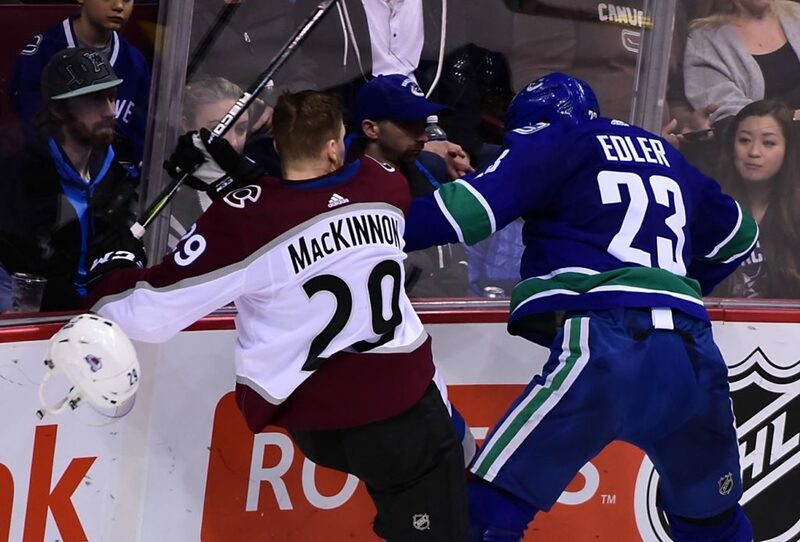 Upon further review back in Denver in the wake of the upper body injury he suffered at Vancouver Tuesday night, MacKinnon isn’t “day to day,” after all. He is days to days. About 14 to 28 days. Coach Jared Bednar’s carefully hedged initial guesses about MacKinnon turned out to be wishful thinking. This team’s reboot and rebound to competence has been so resounding, this is a chance to add to the magnitude of the accomplishment. The Avalanche’s 4-3 overtime win at Edmonton Thursday underscored that. It snapped an Avalanche losing streak at three games and the impact went beyond two points. Fifty games into the season, it’s about avoiding the sort of longer-term slide that could arrest momentum, raise doubts and eliminate swagger. That win guaranteed that, no matter what happens at Winnipeg, when the Avalanche has its oasis single home game against San Jose Tuesday, we won’t be talking about a losing streak. How it came off also illustrated what has to happen for the Avalanche to remain in the playoff race sans MacKinnon. Then Nikita Zadorov scored an artful goal after pouncing on a bad Edmonton clearing attempt. Later, Sam Girard’s shot got through to beat Al Montoya, giving the Avalanche D its second goal of the night — with neither coming from Erik Johnson or Barrie. Gabe Landeskog and Mikko Rantanen had assists on Girard’s power play goal, but otherwise the top line, with Alexander Kerfoot stepping in for MacKinnon, was kept off the scoresheet. Yet the Avalanche got coveted secondary scoring from Blake Comeau and, in overtime, J.T. Compher. The last time Compher scored an overtime game-winner, against Toronto on December 29, he did it while injured and was about to miss eight games. This time, he seemed unscathed. One win, just one win, doesn’t eliminate the possibility that the Avalanche will fall out of playoff contention by the time the schedule becomes more friendly in the final week of February. On Friday morning, the Avalanche was back in the Western Conference’s second wild card playoff spot, but the hold was precarious. It’s about avoiding the perception that a year after the 48-point nightmare, the Avalanche inevitably was going to hit the wall — even with MacKinnon in the lineup every game night. Through the next three weeks, dropping in a win here, and a win there, is potentially crucial. Even if it’s for self-image and preserving the narrative that a torrid stretch run could land the Avalanche in the postseason. The Avalanche already has made it through the absences of longer than three games for Landeskog, Barrie, Compher and Semyon Varlamov. In the cases of Barrie and Varlamov’s injuries, the Avalanche did far more than muddle along without them. Yes, but this is MacKinnon, who is having the breakout year. If his absence lasts two weeks, he would miss a total of six games before returning against Montreal on February 14 at the Pepsi Center. The safest assumption is that this gets into the later end of the timetable. If he is out four weeks, MacKinnon would end up missing 13 games and be back in the lineup against Calgary at home on February 28 — two days after the NHL trading deadline. At that point, the Avalanche will have 20 games remaining. The Avalanche’s surprising progress in this reboot season in large part is the product of Joe Sakic’s patience with the process. Last season, it wasn’t out of line to at least wonder if Sakic’s lack of major moves involved an inability to close a deal…or swim with the NHL’s sharks. (Or Sharks.) It undoubtedly was tempting for Sakic to take the best offer on the table for Matt Duchene or Landeskog … or both. But he held off. It turned out to be the wise approach, leading to the mega-deal that brought so much back for Duchene. Might there be something out there between now and the February 26 trading deadline that would bolster the Avalanche lineup, both until and after MacKinnon is back? But adding a rental at this point of the process would seem discordant, a step away from the approach that has worked so well. If Sakic can pull of a deal for someone that could fit in longer-term, sure. But then you get into the issue of what it would cost, and even flipping one or more of the draft choices acquired for Duchene shouldn’t be part of the discussion. Stay the course. The Avalanche could end up outside the playoff mix and at or near the bottom of the Central Division, but this season still could be portrayed as a success because of the progress — barring an embarrassing collapse and flashback to last season down the stretch. The Nuggets haven’t made the playoffs since 2013. The Avalanche hasn’t since 2014. That represents a lot of dark spring dates at the Stan Kroenke-owned Pepsi Center. Given the nature of the leagues and their respective balances of power, if the Kroenke comptrollers had their choices, they’d probably take an Avalanche playoff berth over a Nuggets playoff berth — if only one could go. That’s because anything — anything — can happen in the NHL postseason, and this is a league that might even have an amazing expansion team, the Vegas Golden Knights, as the No. 1 seed in the Western Conference. Regardless of where the Avalanche is slotted and the first-round opponent, it’s conceivable that Colorado could get beyond the first round. Or even farther. That’s hockey. Although they’re a part of a pack, too, the Nuggets also are in the No. 8 playoff spot as of Friday morning. And if they’re there at the end of the season, they’d almost certainly face … the Golden State Warriors. If that adds to the pressure for Sakic to make a suspect move to only marginally improve the Avalanche’s chances of making the postseason, it would be unwise. There’s more to this than making the playoffs this season. This is about hope for the future. And sticking with the approach that has produced it. Denver-based journalist Terry Frei writes two commentaries a week about the Avalanche for Mile High Sports. He has been named a state’s sports writer of the year seven times, four times in Colorado (including for 2016) and three times in Oregon. He’s the author of seven books, including the fact-based novel “Olympic Affair” about Colorado’s Glenn Morris, the 1936 Olympic decathlon champion; and “Third Down and a War to Go,” about the 1942 football national champion Wisconsin Badgers and the players’ subsequent World War II heroism. His web site is terryfrei.com and his additional “On the Colorado Scene” commentaries are at terryfrei/oncolorado.